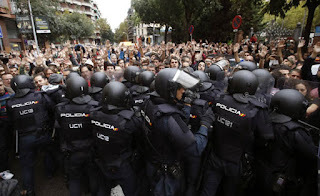 Is Spain in danger of returning to the authoritarian days of the Franco dictatorship? Zoeken Fotocollectie, Dutch National Archives, CC BY The Constitution, and subsequent agreements in 1981 and 1992, organized Spain into 17 autonomous communities. Each has its own executive, legislative and judicial powers. World leaders heralded Spain as an ideal model for peacefully transitioning to democracy. However, its focus on inclusivity, rather than change, meant future demands for self-determination would be shut down. Article 155 of the Constitution states that if an autonomous community operates against the general interest of the state they can be suspended by the Senate.